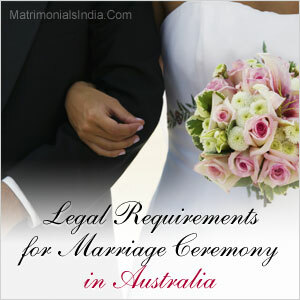 Wedding Vows Even though the wedding ceremony will be organized according to your wishes and will be unique and personal, legal requirements to marry in Australia state that your wedding vows must comply with section 45 of the Marriage Act 1961. Witnesses According to the legal requirement you must have two witnesses over the age of 18. Bank Accounts/Credit Cards You must contact your bank or financial institution regarding their legal requirements. The Wedding day is one of the auspicious days that one tends to cherish all throughout the life. Therefore being a little extra careful about all the necessary requirements especially the legal requirements prior to the wedding will make you stress-free and hassle-free and it will turn out to be the most memorable day of your life.